Delve deeper into the issues surrounding our human population’s foremost challenge! Sign up for this class taught by CAAV’s steering committee chairperson Les Grady. Thursdays, 9:00 – 11:00 a.m. Description: Global temperatures are increasing, ice is melting, sea level is rising, and weather patterns are shifting and becoming more erratic. Climate change is the greatest challenge ever faced by humankind, yet the response to it has been inconsistent with the probable consequences. We will explore why by first examining what science tells us about the causes and how our collective response can shape the impacts on both human and natural systems. We will then examine how our personal values and reaction to alarm influence our individual responses to the message science is sending, leading to possible conflict. Finally, we will investigate potential solutions to the problem of climate change and ways they might be implemented. 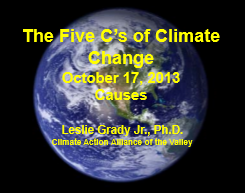 Instructor: Leslie Grady Jr., draws from his long career as an environmental engineer and scientist in academia and industry, and from years of climate change study, to offer clear, graphic explanations and insights into the “Five C’s of Climate Change.” Since moving to Harrisonburg in 2010, he has been an active member of the speakers’ bureau of the Climate Action Alliance of the Valley. Find our facebook event page for this here.